A quiet spot on the Severn, here flowing east from Shrewsbury but soon curving south toward Worcester, Gloucester, and the Bristol Channel. 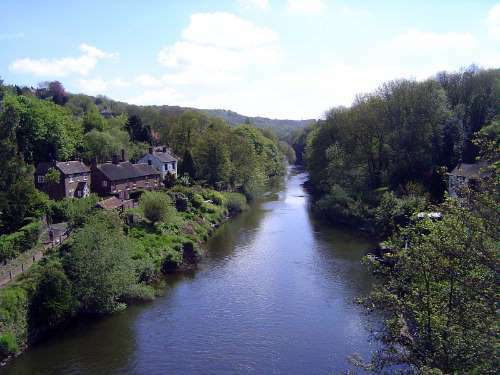 From the 15th to the 19th century the river was used to haul freight as far upstream as Shrewsbury. Two miles from here a wooden bridge crossed the river; two miles the other way there was a stone bridge. In 1709 Abraham Darby at nearby Coalbrookdale discovered how to use coking coal instead of charcoal as the fuel to make cast iron. A ferry was soon in operation. Darby's grandson, Abraham Darby III, undertook to build a new bridge. He did it, incredibly, in all of three months.